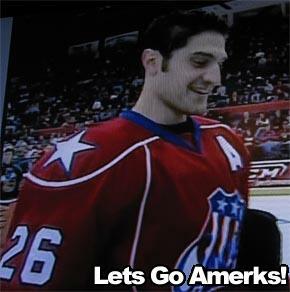 Mark Mancari Sets Record With Hardest Shot · Let's Go Amerks! Mark Mancari is representing the Rochester Americans this weekend in the AHL All-Star game and skills challenge in Binghamton. This evening was the skills challenge where he set a new AHL record in the Rbk O-Stick Hardest Shot challenge with a 102.8 mph shot. His first shot was recorded at 96.8 mph. By comparison, Zdeno Chara of the Boston Bruins won the same competition in the NHL on Saturday with a 103.1 mph shot. Second place in the NHL challenge was Vinny Lecavalier of the Lightning at 101.9. Kurtis Foster held the previous AHL record at 101 mph when he played for the Chicago Wolves in 2003. In the Toyota Breakaway Relay challenge he had a breakway against goaltender Jimmy Howard from Grand Rapids, he took a wrist shot aiming at the top corner glove side of the net but the puck went too high. You can view a video of Mark Mancari in both challenges on YouTube (as of 01/27/08 11pm it’s still processing, so check back later if you’re trying to view it right away). The All-Star game itself will be played on Monday January 28th at 7pm. You can watch the game live on TWSN Channel 26 in Rochester, NY as well as for free online at B2 Networks. The roster features at least one player from every AHL team. In 49 games Mancari currently leads the Amerks with 36 points (13 goals, 23 assists), and is ranked in the AHL. At this rate he’s going to have his highest point season. In the 05/06 season he played in 71 games and had 18 goals and 24 assists. The 06/07 season he played in 64 games and had 23 goals and 34 assists. He replaced Clarke MacArthur who was prevented from participating due to being recalled by the Sabres. Best of luck tomorrow night Mark!